1" square mirrors. 100 mirrors per package. A square Mirror plate is a Great Idea how to display your candles , this mirrored candle plate will add a decorative touch to your home as well as preventing wax drips on your surfaces. Ideal to display an array of candles including Pillar candles Taper And Votive candles. This square mirrored plate will keep your candles upright to ensure no wax spills or drips on your floor or surfaces, keeping them protected. Designed with a round Edge, not only will this candle holder protect your surfaces but it is a great way to reflect the light from your lit candles, to create a dramatic effect in your living space. 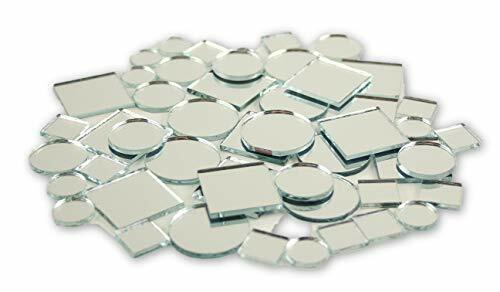 Silver mirror mosaics for craft projects. Perfect for mirror balls, card making and scrapbooking. Please note: This product is made of glass. Please wear gloves to avoid scratching your fingers. 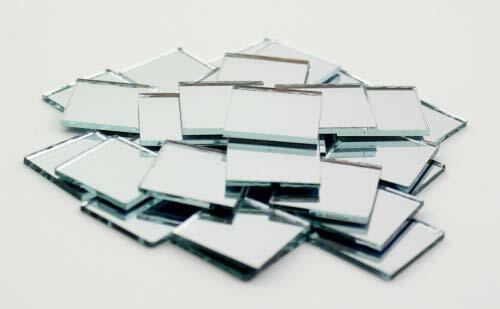 Pack of 12 small square mirrors. Size: 5 inch by 5 inches. A square mirror plate is a great idea how to display your candles including pillar candles, taper and votive candles. This mirrored candle tray will add a decorative touch to your home as well as keep your candles upright to ensure no wax spills or drips on your floor or surfaces, keeping them protected. Used as a table centerpieces, perfume or cosmetics trays as well as for a craft projects such as etching, hand painting, and more. Designed with a Bevel Edge, not only will this candle holder protect your surfaces but it is a great way to reflect the light from your lit candles, to create a dramatic effect in your living space. 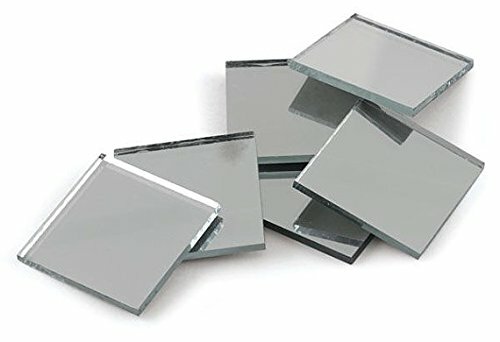 4 x 4 inch Square Glass Craft Mirrors Mosaic Tiles. Bulk Wholesale Cheap 12 Pieces per pack. Mirrors are Approximately 1/16 Inch Thick. Hey have smooth finished edges. These are craft mirrors so they can come with slight imperfections. You can paint or etch these mirrors for customization. Mirrors can help turn all your arts and craft projects into something spectacular without spending a lot. Even the smallest mirrors make a big impact in a multitude of craft and home décor projects. We carry craft mirrors in all sizes and shapes. We promise to take extra care in packing your orders! 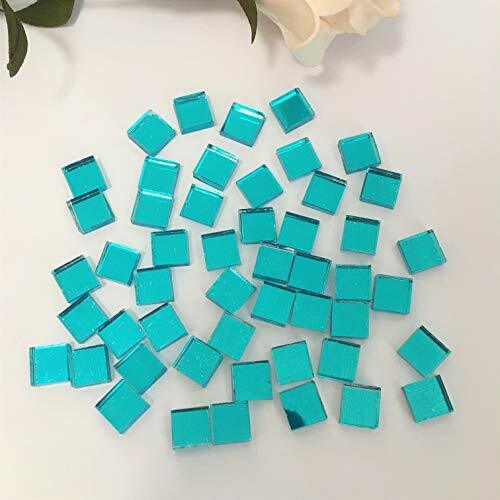 800 Pieces 1 x 1 cm self-adhesive square mosaic tiles, decorative craft mirrors Features: Convenient and simple to use: These mini square mirrors are designed with self-adhesive backing, no need to apply glue. 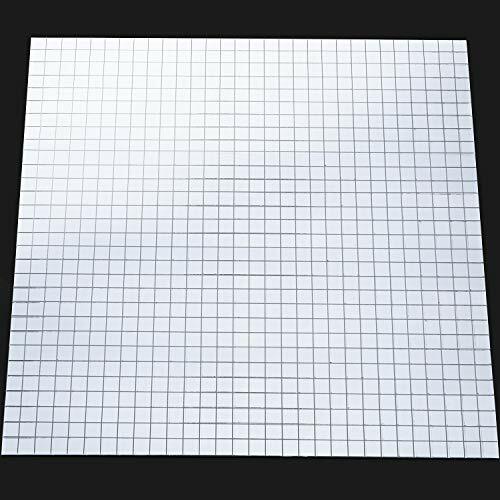 Usage: You can use these square mosaic tiles to decorate walls, interior decorations, ceiling, decoupage, card making, scrapbooking. 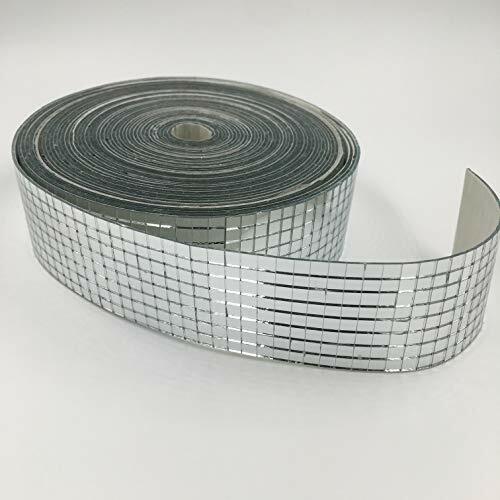 Specification: Color: silver Material: glass Size: 1 x 1 cm each square mosaic tile Package includes: 800 x Square mosaic tiles Note: This product is made of glass. Please wear gloves to avoid scratching your fingers. This product is made of glass, which will inevitably cause some corner broken in transportation. So in fact, we delivery 900 pieces mosaic tiles for every package. 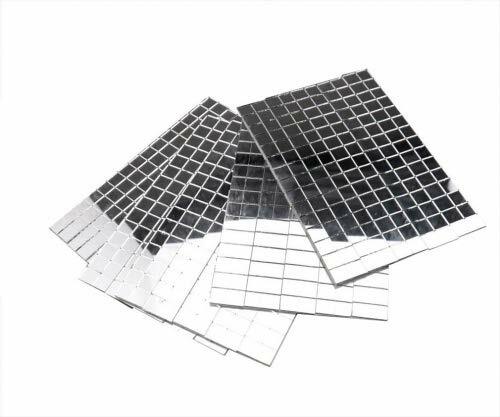 2 x 2 Inch Square Glass Craft Mirrors Mosaic Tiles 12 Pieces per package. Mirrors are Approximately 1/16 Inch Thick. Hey have smooth finished edges. These are craft mirrors so they can come with slight imperfections. You can paint or etch these mirrors for customization. Mirrors can help turn all your arts and craft projects into something spectacular without spending a lot. Even the smallest mirrors make a big impact in a multitude of craft and home décor projects. 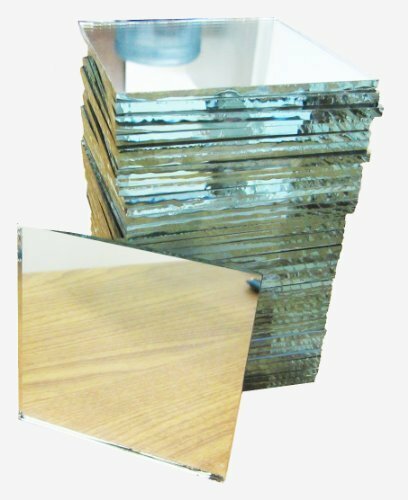 We carry craft mirrors in all sizes and shapes. We promise to take extra care in packing your orders! Mini Small Square & Round Glass Craft Mirrors Mosaic Tiles. Bulk Wholesale Cheap 100 Pieces Pack. Mirrors are Approximately 1/16 Inch Thick. These are craft mirrors so they can come with slight imperfections. Mirrors can help turn all your arts and craft projects into something spectacular without spending a lot. Even the smallest mirrors make a big impact in a multitude of craft and home décor projects. 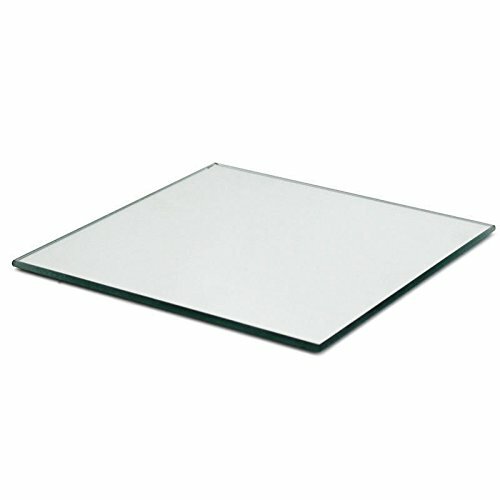 We carry craft mirrors in all sizes and shapes. We promise to take extra care in packing your orders! 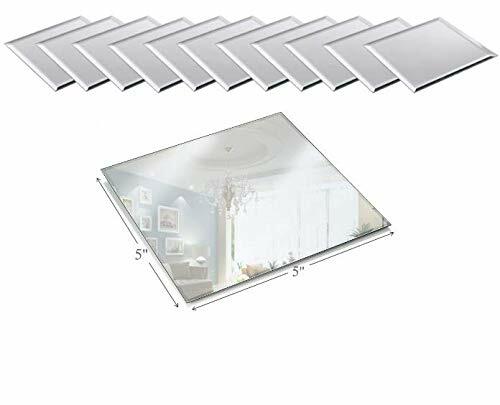 144 Pieces 2.5 x 2.5 cm Square mosaic tiles, self-adhesive craft mirrors, small decorative tiles More features: These are real glass mirrors, which is very beautiful and unique for DIY crafts. Usage: These glass cuts are suitable for disco balls and can be applied to decorate your kitchen, bathroom, bedroom, and crafts. 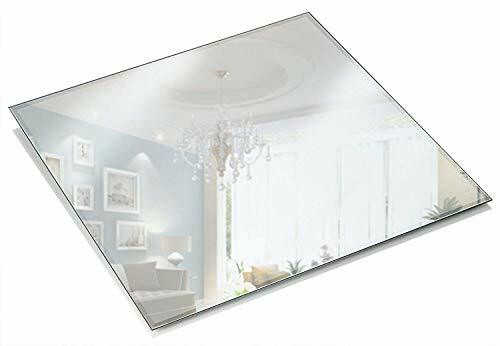 Specification: Color: silver Material: glass Size: 2.5 x 2.5 cm Package includes: 144 x Square mosaic tiles Warm notice: This product is made of glass, which will inevitably cause some corner broken in transportation. 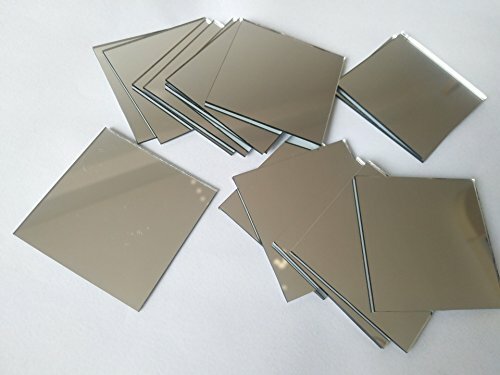 Mirrors measure at 3/8''x3/8'' (10x10mm) Smooth edges Real glass material Each order includes a package of 100 mini square mirrors Great for kids crafts, school art projects, holiday ornaments and seasonal decor. 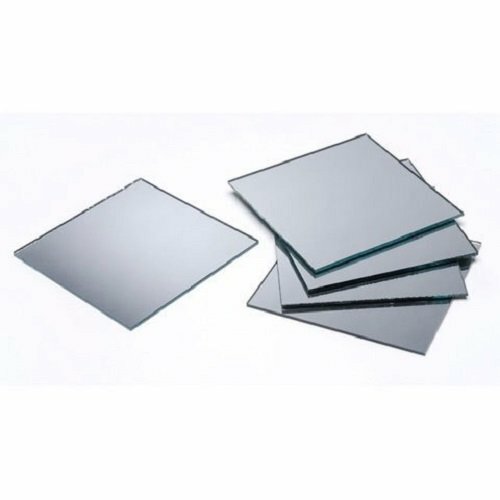 Pack of 12 square mirrors. Size: 10 inch . A square mirror plate is a great idea how to display your candles including pillar candles, taper and votive candles. This mirrored candle tray will add a decorative touch to your home as well as keep your candles upright to ensure no wax spills or drips on your floor or surfaces, keeping them protected. Used as a table centerpieces, perfume or cosmetics trays as well as for a craft projects such as etching, hand painting, and more. Designed with a Bevel Edge, not only will this candle holder protect your surfaces but it is a great way to reflect the light from your lit candles, to create a dramatic effect in your living space. 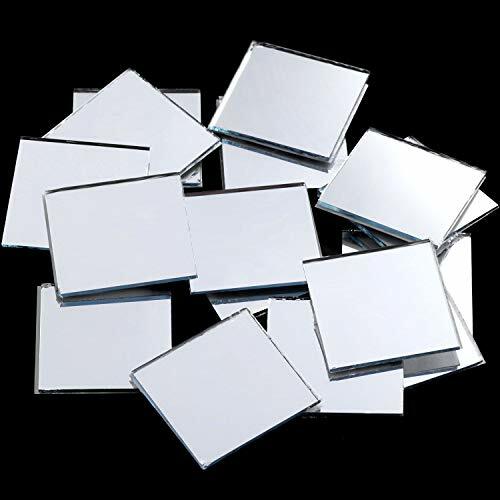 Total of 200 Pcs clean cut, 3x3 inch silver coated square mirror bulk lot sale. A great value for the price and the best deal online! Great for people needing to work on craft ,art, and decoration. Hope you have alot of fun and thank you for viewing this. Take advantage of this great offer while supply last! Exclusive sold by Happy Starla Only! 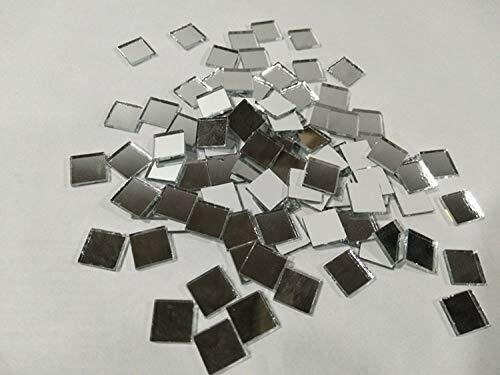 3 inch Square Glass Craft Mirrors Mosaic Tiles 10 Piece Pack. Mirrors are Approximately 1/16 Inch Thick. Hey have smooth finished edges. These are craft mirrors so they can come with slight imperfections. You can paint or etch these mirrors for customization. Mirrors can help turn all your arts and craft projects into something spectacular without spending a lot. Even the smallest mirrors make a big impact in a multitude of craft and home décor projects. We carry craft mirrors in all sizes and shapes. 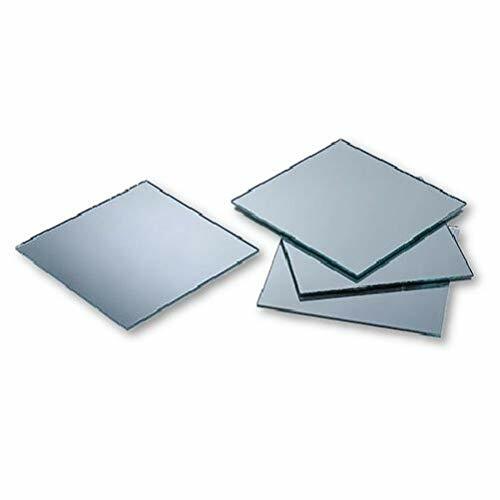 Call them: craft mirrors, square craft mirror, craft mirror squares, square mirror tiles. We promise to take extra care in packing your orders! Warning: Caution when handling. Made out of Glass. This product is not for children.